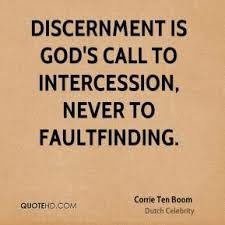 The Grande Dame of faith, Corrie Ten Boom, had it right in this thought. Most people use their sense of discernment for the purpose of criticizing, as mentioned in the last section. When you see something that is out of kilter with another believer, rather than criticizing, try praying for them. There is something else that must also be considered, though—What is this doing to ME? When counselling or coaching someone who cannot seem to get traction for their life, it often becomes necessary to examine their relationships. This examination is based on the reality of 1 Co. 15:33, which so many in the church today seem to ignore. This same process should be applied to your school, your job, your church. Any glib, off-the-cuff answer is a sign that you have not taken the time to truly think about the question and its importance. Let the question rumble around within your being for a moment. FEEL the answer. This is not something with which we have much experience, so it generally takes quite a bit of time and goes into more than one session with the client. Exploring new territory in a new way can be daunting without an experienced guide. When something is recognized (discerned) as not being exactly right, what are you to do? This is where it gets sticky in our practice and exercise of discernment. Often we may have to do something for which we apparently have no reason. Someone will ask you, “Why not?” but you cannot articulate an answer. For me, this has been a problem most of my life. When I do not have a “legitimate reason,” I will back away from my ‘feeling’ and go with the pressure presented by the other. Let’s consider the lesson of 1 Cor. 15:33 for an example of this. It is a verse stuck in the middle of Paul’s argument for the resurrection of the body. The two words translated ‘communications’ and ‘manners’ occur only here—nowhere else in the NT. Also, there is nothing before or after this verse telling us what we should do about this. It is simply a warning that false teaching will mess with your life. If you don’t know what ‘bite’ means, or the results of being bitten, then you may not do anything with the information. If you don’t know what ‘careful’ means, then you won’t know how to respond to the warning. All you have is the sense of warning about something; and that will only do you a little good if you have learned to heed warnings. So—we have this warning from the Word, and the Holy Spirit makes it real to our heart one day. I begin to feel that a certain person I’ve been developing a relationship with may not be quite healthy. I can’t ‘put my finger’ on anything specific—it’s just a negative feeling. They ask me to go with them to do something, but I have this ‘check’ in my spirit—a gut-feeling, if you will. If I say “No,” they will ask me “Why not?” and I don’t have a good reason. Have you ever found yourself in that dilemma? I have been there hundreds of times as the Lord has been teaching me this lesson I am now sharing with you. I usually back away from my ‘gut,’ and give in to the pressure from the other. Sometimes, that has cost me dearly. What we may call a ‘gut feeling’ is, more often than not, discernment working its way into our consciousness. We will not always be correct with our ‘gut feeling’ as we are learning to listen to the voice of the Spirit, because often, the voice of the Spirit is contrary to the voice of reason (Gal. 5:17). Just because we may get it wrong, however, is no indication that we are not to continue to try. We must—absolutely MUST—begin to train our senses to discern differences, and then to act on whatever it is we think we’ve discerned. We will continue to examine this concept of our associations in light of discernment in the next installment.